Barnes and Noble has received multiple bidders to purchase the entire bookstore chain and the Nook. The bookseller said on Wednesday that they would form a launch a formal review process to evaluate its strategic options. A special committee of the board will lead the review. Leonard Riggio the largest shareholder has has committed to support and vote his shares in favor of any transaction recommended by the Special Committee. This committee was formed because this summer B&N received a very serious offer from another bookseller, but pulled out when they conducted their due diligence. Obviously the committee is going to make it easier for anyone else to come to the table with a buyout offer. Physical book retailing has been under assault for the better part of two decades from the rise of Amazon.com Inc. and online distribution. The Seattle company now accounts for 60% of all books sold online, including physical and digital books, according to Peter Hildick-Smith, chief executive of book research company Codex Group. Borders the other major chain in the US, filed for bankruptcy protection in 2011 and later went into liquidation. 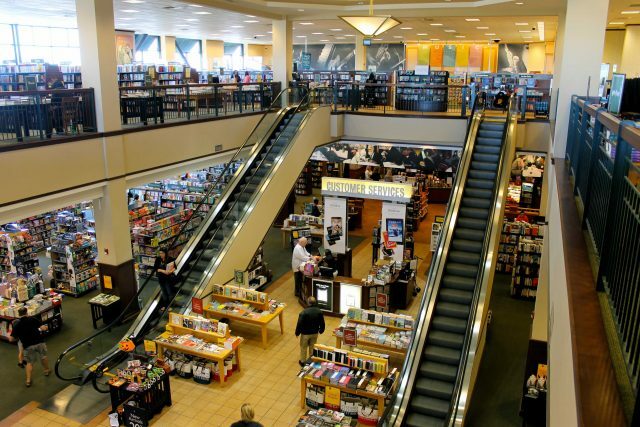 In its most recent quarter, Barnes & Noble’s comparable sales fell 6.1% amid a strong consumer environment and rebounding sales of physical books. Despite a number of facelifts, the chain’s website has also failed to win favor with online book buyers; online sales fell 14% last quarter. In order to turn the website business around the company fired Fred Argir and hired their former CFO to fill the void. Adding to the pressure on the company, Barnes & Noble has had five CEOs in the last six years. Its most recent one, Demos Parneros, was fired abruptly in July after just more than a year in the job for violating company policies. He has since filed a lawsuit the company for alleged wrongful termination. Many activist investors have tried to buy the company in the past twelve months, but were shut down and forced just to buy normal shares. It remains to be seen if Barnes and Noble is interested in just selling their ailing Nook division, Rakuten Kobo seems to have the most interest. I don’t have a car, the closest B&N store is an unpleasant ride of several miles, and they have a web store, just like Amazon! Go figure. There’s a book that my local independent can’t supply me with. I just looked it up on B&N. They can’t either. In fact they only list one title (of many) by the author, and it’s out of stock. Looking at Amazon. Sure, which one of his books do you want? Just click here and it’s on the way. From the independent seller thousands of miles away who happens to currently have a copy. When I were a wee bairn John’s store was my Holy of Holies. I have no such attachment to the corporate chain, but I have spent many hours at my local version, bought many books from them, and a number from the website as well. If they are failing I’m afraid it isn’t due to Amazon. It’s due to the fact that they have failed. Bezos ( who I am no fan of at all) got the job done. Riggio didn’t. The last physical book I bought, a year ago, is a paperback. Large format, rather thick and tiny print. Reading it reminds me of why I like e-books. Just two years ago I would have laughed at the idea (and I’ve been dealing with e-texts since the 70s), but now I not only prefer e-reading, but have the same reverence for my e-reader (in real leather case) as I do for hardcover books. Things have really changed. So why did I buy it? Because it’s only available as a paperback. It’s nonfiction, contains photos, graphs, maps and piles of reference notes. Maybe when high resolution, 13″ e-readers are commonplace, cheap, the operating systems are well designed to handle reference works and I’m not the only one who cares about the particular volume it will come out as an e-book. But this is a bit off the topic of B&N failing. Their e-book division failing particularly hard. Amazon had no particular advantage there. In fact B&N had a number of advantages, but they didn’t use them well. I mean, no, except for unlimited money and no pressure from stockholders to show a profit.